Usurper in waiting Guaido is a front man for the Trump regime’s coup attempt to topple democratically elected President Maduro. Most of all, the scheme aims to eliminate Bolivarian social democracy, wanting Venezuela transformed into a US vassal state, gaining control over its world’s largest oil reserves and other valued resources. Tactics include naked aggression, color revolutions, and old-fashioned coups like what’s ongoing in Venezuela – so far failing to achieve its objective because Maduro increasingly enjoys popular support. The nation’s military backs him. Around three-fourths of world community nations and the UN refused to recognize imposter Guaido as interim Venezuelan president. He’s increasingly drawing smaller crowds, according to observers on the ground. Most Venezuelans want Bolivarian social democracy preserved and protected. They oppose foreign intervention in any form, overwhelmingly against it militarily. 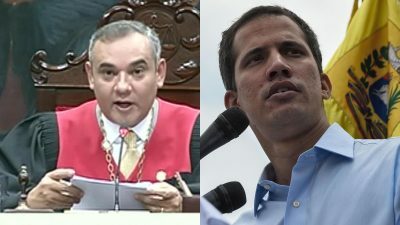 On Monday, Venezuelan Chief Supreme Court Justice Maikel Moreno called on the nation’s Constituent Assembly to strip Guaido of parliamentary immunity for flouting a High Court order, banning his foreign travel without court permission, illicit financial activities, inciting street violence, and other offenses. Established by national referendum to revise or rewrite Venezuela’s Constitution, restore and maintain order, as well as serving everyone in the country equitably, the Constituent Assembly is the Bolivarian Republic’s highest legal authority. According to Article 349 of Venezuela’s Constitution, no other power can “in any way impede the decisions of the National Constituent Assembly” – not the president, National Assembly legislators and Supreme Court justices. In 2016, Venezuela’s High Court declared National Assembly actions “null and void” for illegally seating three members accused of electoral fraud. Because National Assembly actions are “null and void,” Venezuela’s Constituent Assembly assumed its powers. Assembly deputies called for creating a people’s court to prosecute individuals involved in the Trump regime’s coup plot, wanting them held accountable for their lawless actions. So far, no warrant was issued for Guaido’s arrest. He remains under investigation, pending whatever actions Constituent Assembly members intend to pursue against him.